The 48 Hour Book Challenge for 2010 has concluded. Be sure to stay tuned to MotherReader for announcements of the 2011 challenge! How many books do you think you could read and review in 48 hours? Four? Fourteen? Forty? When I decided to launch the 48 Hour Book Challenge, I had forty books stacked on my floor. Forty. Now... I don’t even want to count. With The 48 Hour Film Project still in my brain, I formed an idea. A terrible, wonderful, awful idea. How many books could I read in 48 hours? But even more importantly, how many could you read in 48 hours? 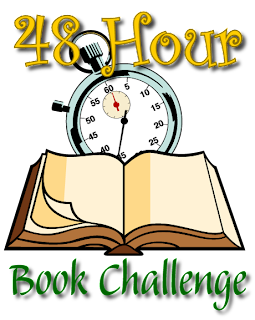 Thus I submitted to the kids’ lit book bloggers at large the Mother (Reader) of All Challenges: The 48 Hour Book Challenge. Think about it. A bevy of book bloggers see what they can read and review in 48 hours. That gives us a little something to talk about at ALA. Who knows? Maybe we could get some press covering us for a change. As of 2009 we began to connect the 48HBC to charitable causes, and folks were able to connect their personal readathon to a Greater Good of their choice. Readathons can be based on sponsors, comments, books read, or something else entirely. Readers can choose not to participate in this aspect of the 48 Hour Book Challenge, though they may find a way to support others’ efforts by leaving comments (if that’s what is being tallied). Prize packages are awarded to the winners, and other “door prizes” are given to participants selected at random. Past prizes have included original sketches from Mo Willems and Matthew Holm, signed and sketched books from Adam Rex, loads of signed books, t-shirts from Threadless, artistic blank journals, jewelry, gift cards, notecards, and more. Good stuff. The weekend is usually in the beginning of June, and is publicized at least a few weeks in advance (depending on how on-the-ball I am during those end-of-school weeks). Read and blog for any 48-hour period within the Friday-to-Monday-morning window. The books should be about fifth-grade level and up. Adult books are fine, especially if adult book bloggers want to play. If you are generally a picture book blogger, consider this a good time to get caught up on all those wonderful books you’ve been hearing about. Graphic novels can be included in the reading. One audiobook can also be included in your time and book total. The top three winners will be based only on time commitment, not number of books. So if you are heading into the 30+ hours club or 40+ hours club, track your time carefully. International winners may be given gift cards instead books due to mailing costs, unless a U.S. address is provided. It’s your call as to how much you want to put into it. If you want to skip sleep and showers to do this — and some people do — go for it. If you want to be a bit more laid back, fine. But you have to put something into it or it’s not a challenge. Twelve hours is the benchmark for door prize eligibility. The length of the reviews or notes written in your blog are not an issue. You can write a sentence, a paragraph, or a full-length review. Up to you. The time spent reviewing counts in your total time. You can include some amount of time reading other participant’s blogs, commenting on participating blogs and Facebook pages, and Twittering about your progress (remember the #48hbc tag!). For every five hours, you can add one hour of networking. This time counts in your total time. On your blog, state when you are starting the challenge with a specific entry on that day and leave the link to that post at the Starting Line post (which will be on MotherReader at the beginning of the challenge weekend). For the past couple of years, I’ve been using Mr. Linky to make the sign-in easy. When you finish, write a final summary that clearly indicates hours — including partial hours — you spent reading/reviewing/networking, the number of books read, and any other comments you want to make on the experience. It needs to be posted no later than noon on Monday (Eastern Time — so that I have a base time to tally the results). Also, check in at the Finish Line post on MotherReader that will be posted Sunday and please link to that post from your final summary post. Do I need to have a blog to participate? Pretty much. But if you set one up just for this challenge, you wouldn’t be the first to do so. You might find that the 48HBC kicks off a new hobby for you. Do you have to register with Mr. Linky before you can use it? Not that I know of. You should only have to register with the Mr. Linky site if you are hosting this type of listing on your blog. Since you will simply be signing in on my blog with the Mr. Linky I’ve set up, you should be fine. Can I count time reading to my child? Can my kids join in? You can certainly count time reading aloud to your child — or to anyone, for that matter — as long as you’re using chapter books. Kids can always play along for the fun of it, no prizes are offered. However, that doesn't mean that you couldn't give your own prize to your kid. Why not? How does this reading for charity thing work? Any way you want. I’ve been reluctant to assign a specific method or charity, because I want to allow bloggers the freedom to choose — including whether they want to participate in this aspect of the 48HBC. You can donate a set amount per hour you read and even seek sponsors. You could donate based on the number of comments or books read or the total number of 48HBC finishers or something else I’m not thinking of. My default charity is Donors Choose, because you can select a particular book-related project for your own state. You are welcome to join me in supporting through that organization, or work on funding for another. How can I contact you to donate prizes? Write me at MotherReader AT gmail DOT com and let me know what you’d like to donate. I usually pull together a bunch of things — books, jewelry, notecards, T-shirts, etc. — to make prize packages for the winners. I also like to have a few authors who’d be willing to send a personalized, signed book to a blogger for a few randomly selected “door prizes.” I’ll also take critiques, illustrator art/sketches/doodles, an offer to name a character in a book after a winner, or an eReader. A girl can dream. Where are bloggers putting their small kids while doing all this reading?